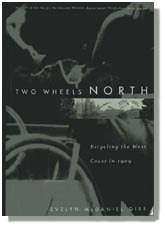 Evelyn McDaniels Gibb's "Two Wheels North: Bicycling the West Coast in 1909"
It's 1909. Two teenage boys have just set out from Santa Rosa, California. Their objective is to visit the Alaska-Yukon-Pacific Exposition in Seattle, Washington. Victor McDaniel and Ray Francisco, both fresh out of high school, are making the 633 mile journey by bicycle. They've allowed 64 days for the trip. During those 64 days, they will deal with challenges ranging from slick-talking scam artists in saloons to gang work on a paving crew in hundred-degree heat. More than once they will encounter Native Americans, still somewhat shy of the Caucasian, making the adjustment to "modern" society. On other occasions they will meet young women who tug at their hearts and almost distract them from their goal. Written by the adult daughter of Victor McDaniel, this story chronicles that incredible adventure. A smattering of historical detail serves to put the pair's achievements into perspective. At the time they set out, their home town boasted just two electric automobiles, the Wright Brothers had yet to make a successful flight, and Italian masons were still chiseling stone to re-pave the earthquake-riddled streets of San Francisco. And, of course, the roads of America were yet to be paved. It is Victor's vivid description of biking in the era before asphalt which makes his story so attractive to cyclists. He relates the rigors of riding singlespeed bikes, fitted with racks by a local blacksmith, over hundreds of miles of road and trail surfaced variously with gravel, oiled dirt, cornhusks and railroad trestle. The intrepid pair have to resort to some pretty inventive techniques to complete their journey successfully: hiring blacksmiths to carry out frame repairs; towing branches on steep downgrades to save their brakes; carrying firearms for protection and hunting. More than once they have to double back due to poor signage or disappearing roads, but in the end, of course, they make it. I won't ruin your experience by telling you any more. I can promise you that you'll enjoy this story of cycling adventure. Maury Cohen is an avid cyclist who works at LowePro in Santa Rosa. Like cycling books? Here's Will reviewing Josh Cohen's book on bike saddles.